These high pressure Jet Nozzles are made from abrasion resistant tungsten carbide offered in seven sizes between 7/32 through 16/32, smaller sizes are offered on special request. Nozzle sizes ranging from | 04 | 05 | 06 | 07 | For other sizes please contact us for delivery time. These high pressure jet nozzles are made from abrasion resistant tungsten carbide. Their compact size makes them ideal high pressure Oil & Gas tooling where size is a consideration as well as the utility drilling segment of the horizontal directional drilling industry ( HDD). 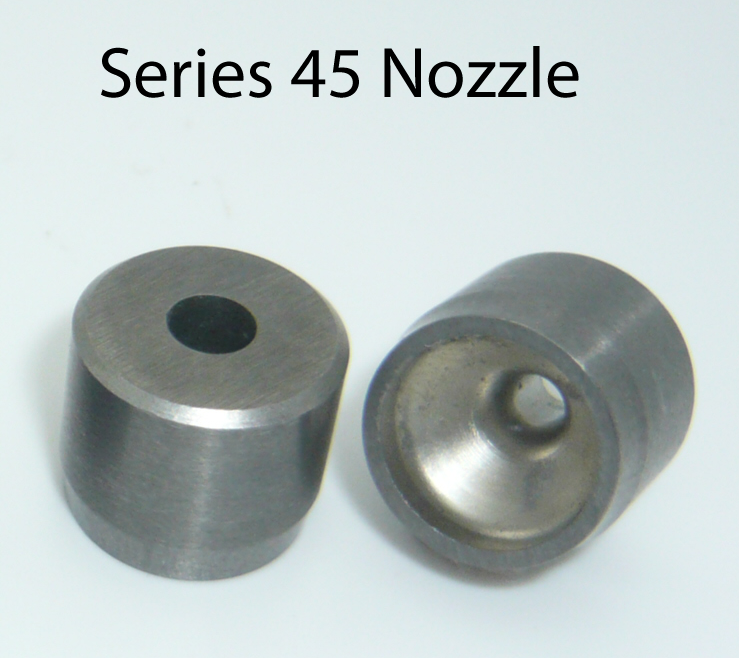 These nozzles can easily be incorporated into various downhole tools, including but not limited to, bits, hole openers, fly-cutter reamers, barrel reamer’s, or any tooling where high pressure, high velocity fluid is required. They are designed to compress drilling fluids as it is pumped through the nozzle thus increasing the velocity of the drilling fluid as it exits the nozzle. High pressure flow across the cutting surface increases ROP (rate of penetration) as well as increasing the life of the cutters. By efficiently removing the cuttings away from the leading edge of the cutter insurers that cuttings are not being re-cut or act as an abrasives which will shorten the life of any cutter. Nozzles can be ordered in a variety of nozzle sizes ranging from 04 | 05 | 06 | 07 | For other sizes please contact us for delivery time. 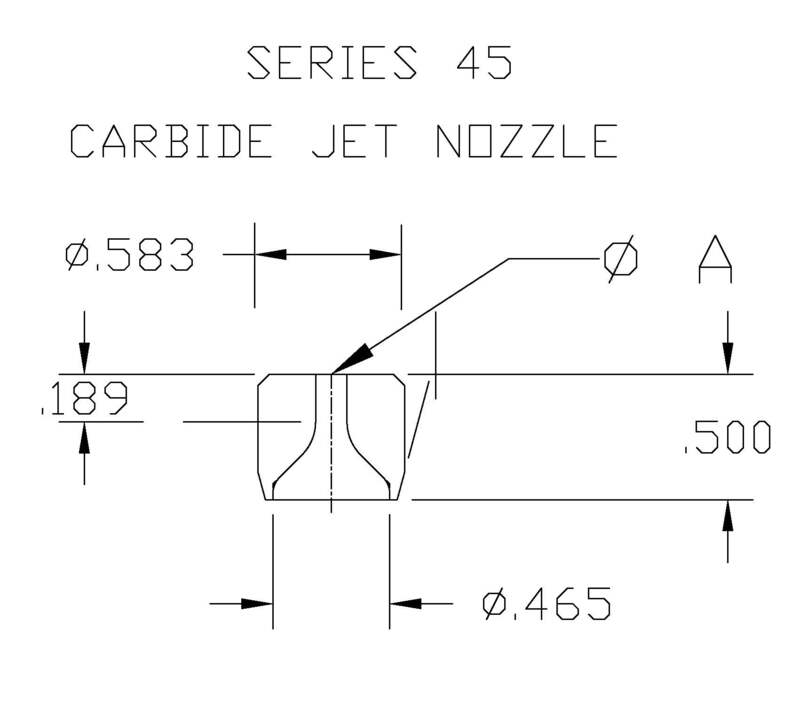 Series 45 Carbide Nozzle Drawings and Dimensions General overall dimensions of a Series 45 Carbide jet nozzle. 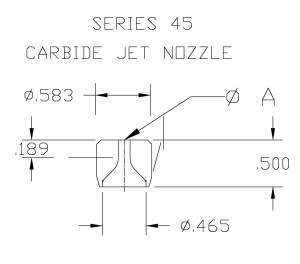 These dimensions can be used to determine the suitability of this nozzle for your application and or to confirm the series 45 is interchangeable with your current nozzle. Note that the critical dimension is generally the OD, with the overall height being less critical. 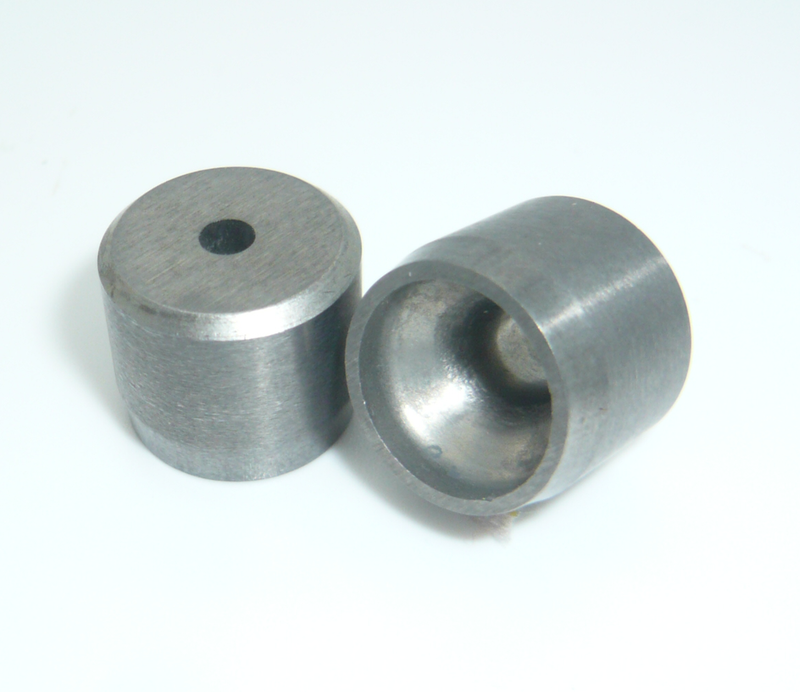 Some tooling designs will accept the carbide nozzle directly otherwise, we recommend our threaded Nozzle Retainer.